In the last two blog posts, I talked about how to find the inverse of a matrix and how to calculate the determinant of the matrix. Please review these two blog posts before continuing, if you are not familiar with either topic. As you saw in the inverse blog post, calculating the inverse of a matrix can require a lot of steps and some time. In this blog post, I will go over a shortcut for calculating the inverse of a 2x2 matrix. Not too difficult, right? Let’s see some examples. This shortcut will help make calculating the inverse of a 2x2 matrix easier. That concludes our blog post series on matrices! For more help or practice on this topic, check out Symbolab’s Practice. Last blog post, I talked about what the inverse of a matrix is. In this blog post, I will go over what the determinant of matrix is and how to calculate. The determinant is a value calculated from an n\times n matrix. The determinant of a matrix, A, can be denoted as det(A), det A, or |A|. There are many uses for determinants. The determinant can be used to solve a system of equations. The determinant can tell you if the matrix is invertible or not (it is not if the matrix is 0). We will discuss three ways to solve three different types of matrices. 3. If rows were swapped, multiply the product of the elements in the diagonal by (-1) raised to the number of times rows were swapped. This will give you the determinant. Let’s see some examples to better understand how to calculate the determinant. Since there is already a blog post on how to put a matrix in REF, I am not going to go through the steps for doing this. You can look at the link for this last example to see how to do this. Note that rows were swapped 3 times to achieve putting the matrix in REF. 3. 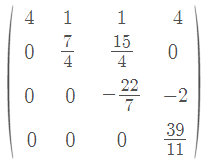 If rows were swapped, multiply the product of the diagonal by (-1) raised to the number of times rows were swapped. As you can see, this is a lot of material to learn and remember. Don’t let it intimidate you! Once you start practicing, it will get easier. For more help or practice on this topic, check out Symbolab’s Practice. Next blog post, I will talk about a shortcut for calculating the inverse of a 2x2 matrix, using its determinant.